One-story board and batten church with steep gable-composition shingled roof with an overhang supported by carved brackets. At the center of the front elevation is a circular window with dentil molding that surrounds it and continues horizontally to the gable sides. There are pointed-arch, fixed windwos on either side of the façade. On the sides are doublehung, pointed arch windows. At the front is a projecting enclosed entrance vestibule with double paneled doors at the entrance. One story wing in back, small clapboard studio in the rear. 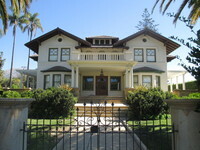 A series of sandstone steps and retaining walls lead from the street up to the Neoclassical covered porch, which shelters an extra-wide Craftsman inspired front door. Slender Doric columns support the front porch roof. The front door and flanking windows feature pointed arched mullions. The façade is symmetrical except for slight differences in the bay windows. A 10 ft stucco wall looms over an interior patio on the Chapala Street frontage. 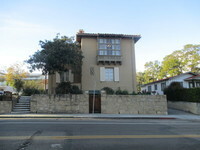 Along Mission Street, the wall extends from the corner building to the right end of the property. An arched doorway with a wooden gate leads from the outer wall into the inner courtyard. Three arched windows with wood framing grace the structures Mission St façade. Windows opening to Chapala St are paired casements with wolded stucco sills. A single tower, now positioned on the lot corner, is the most distinguished remnant from the original structural complex. Building features include a red tile roof, door arches, tower, decorative tile, stucco walls, chimney top and focal windows making it a perfect example of the period's architecture. 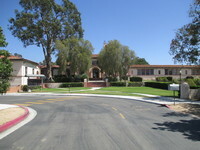 The one story building with communication through open cloisters depended upon its mass, color, and proportion for interest rather than ornamental detail. Large fortress like structure. The Theatre arcade entrance presents a low key profile with a large, graceful arch and arcade of columns. The marquee cantilevers over the sidewalk. Setback and to the left side of the building is a tall steeple. The hipped roof is covered in red tile . 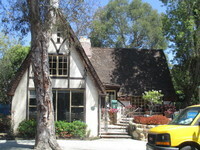 English Cottage style single-story house with loft. The roof is gabled with a steep pitch and wood shingles in a false thatch or "Rapunzel" style cover the roof and fold over the eaves. A three pot chimney sits at the peak of the roof to the right of the prominent cross gable. Mildred Moody's rosemaling designs are featured on the interior on the fireplace hood, on cabinet doors, and on the wooden valences. 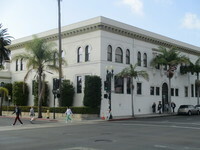 Flat roofed, two story stucco building of imposing style and size. The cornice is decorated with egg and dart motif all the way around the building. There are prominent brackets under the eaves. The building is symmetrical with a center set of semi circular windows on the second story, and several sets of flat double-hung windows on the first story. 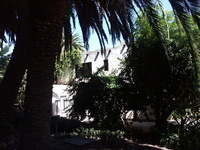 There is a large informal garden and a rental cottage in the back of the building. An attached wall continues past the building, hinding a parking lot. One-story, gable-roofed, eavefront structure with an altered symmetrical plan. Two smaller scale hip-roofed wings flank the main portion; a gabled ell projects from the center front of the house. Interior brick chimney. Wood shingled siding; rolled asphalt roofing. Fenestration is predominantly 1/1-light double hung wood sash. Multipaned French doors. A two-story building with a hipped and gabled roofline covered with red clay tiles. The building's Modoc Rd frontage has varying setbacks, each bay having a different pattern of window placement. The two-story portion on the west has a small ornamental tower. The end bay has a stucco mirador. The second floor of the main section has spindled windows. There is a corbel band and a jar motif at the end of the easterly section. The structure is of reinforced concrete with a stucco finish. 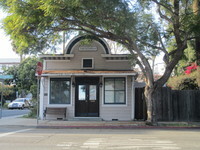 Single-story, stuccoed brick commercial building fronting on De la Guerra Street in downtown Santa Barbara directly across street from Ciyt Hall. Symmetrical façade has an arched window at each side of centered arched doorway, cornice at eave line and low parapet above. Five double-hung windows and double door, probably original, remain on SW side. Hipped roof is covered with composition shingles. Glass-enclosed porch at rear appears to be later addition. Garden at rear was relandscaped about 1975. 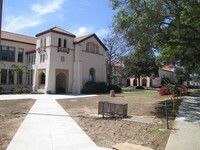 Building and grounds are in good condition. 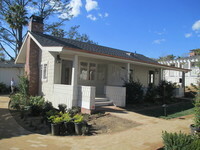 The one-story stuccoed dwelling is constructed of adobe bricks and designed in a provincial Spanish Colonial Revival style. The structure is a modified H-shape, with a tile gabled roof. 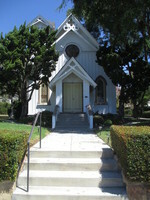 The main front door has narrow planks; all trim is wood painted in faded Santa Barbara Blue. 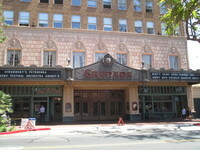 The building is eight stories high constructed with the theatre in the center and two shops on either side. It is built of steel reinforced concrete with a brick and glazed terracota façade. The roof is red tile and steeply hipped. The façade of the building features many Spanish renaissance architectural details with ornamentation of the brick and terracotta tile. This is a two-story building with a wooden balcony constructed nearly all the way across the second floor that features turned wooden spindles. To the left of the balcony is an 8 light recessed casement window. Behind the balcony are two 2-sash windows and a pair of French doors. The roof is flat with a Mission-tiled shed roof section. The first floor (altered) features two glass entrance doors and plate glass show windows. 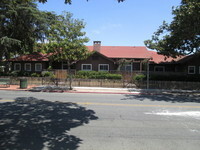 This is a one-story wood frame Craftsman Bungalow style house with the ridgeline of the roof running parallel to the street. Centered in the roof is a prominent attic dormer with exaggerated exposed rafters and a seven over seven window. Its gable end faces the street. The porch extends the length of the street façade, and is supported by brick piers at either end. The façade of this clapboard building is symmetrical with a large horizontal fixed glass window on either side of the central entrance door. 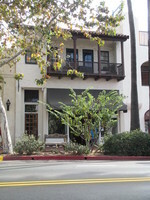 The Mihran Studio is a two story office building of white stucco on a raised stone foundation. The flat roof with tile sloped parapet. It's most outstanding feature is the overhanging balcony extending around all four sides of the building. The railings are wooden as well as the frames of the small paned windows. Decorative stenciling is around the doors and windows. A one story and a two story extensionb have been added to the rear around an enclosed patio. 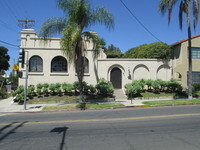 This building contributes to the Spanish Colonial Revival Streetscape. 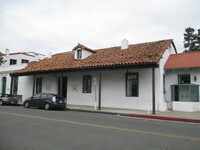 The Spanish Colonial Revival is a two story building with an irregular rectangular shape with a tile roof. The house features a stucco exterior. There is a moorish style wooden bay window and the right hand side of the second story. Other windows are casement windows featuring wooden shutters. Surrounding the front of the house is a stone retianing wall.